This post is all about how to increase your dog’s impulse control. Or, self-control. By that, I mean helping your dog control his impulses to things like grabbing food, chasing the cat, whining, nipping, barking or jumping. It’s all about teaching a little bit of patience! My dog Remy is an example of a dog with VERY limited impulse control, so I will be working on all of this right along with you! 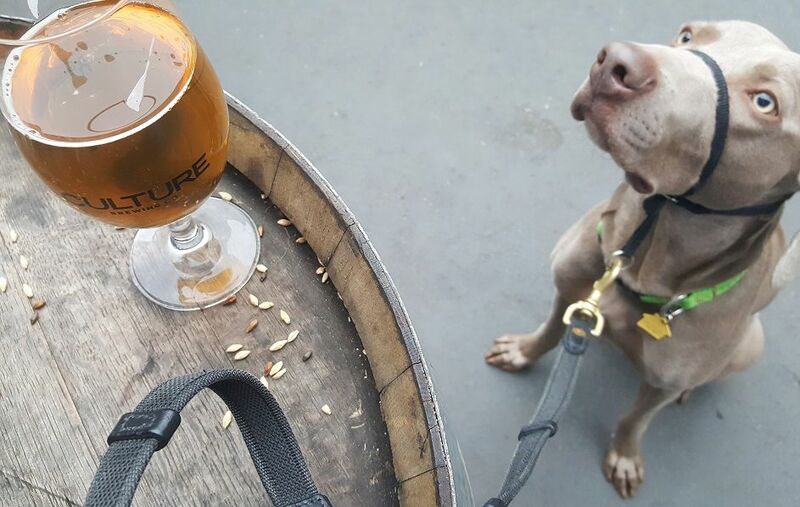 A dog that learns some impulse control will have an easier time restraining himself from jumping on guests, barking at the cat or grabbing cupcakes off the table, for example. Before we get into how to increase your dog’s impulse control, I want to share some classic signs that your dog might need some work (Remy!). All dogs probably have an issue with at least 1 or 2 of these examples, but if your dog seems to have issues with nearly ALL of these he probably needs some work with impulse control! Again, these are just some general examples. All dogs bark or whine at times, anxiety and aggression can be caused by a number of issues and most dogs are “rude” if they’ve had little training. There are many ways to increase your dog’s impulse control but I decided to keep this list to five ideas. I’ll look forward to hearing your examples in the comments. 1. Work on basic obedience skills. This is a foundation for building some self-control. 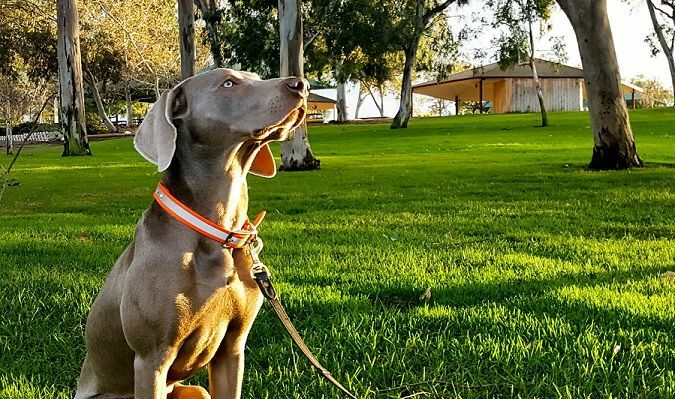 Most of us can figure out how to teach a dog sit, down and stay, but the hard part is working on this every day in order to build a rock-solid foundation. We should all be working with our dogs every day on these basics so they will sit, lie down and stay on command even in distracting areas or when they don’t feel like it. Obviously, it starts at home for a few seconds and then we need to look for ways to challenge our dogs more and more. Maybe it’s something as simple as asking them to stay and then dropping treats on the ground as a distraction. Maybe it’s asking them to lie down before heading out for a walk. Maybe we ask them to lie down and stay for a full minute before they eat rather than 3 seconds. All our dogs are at different levels as far as basic obedience and there is always, always room for improvement. I can’t stress enough how important these basics are. Often, when someone emails me asking how to stop her dog from jumping or how to stop her dog from barking, it comes down to a lack of obedience training. If your dog won’t sit when asked with no distractions, how on earth could the dog possibly have the self-control not to jump on someone in an exciting environment? Taking any type of training class can really help. Don’t obsess about what “style” is best. Any training is usually better than no training. 2. Ask for a simple task before your dog gets what he wants. Look for small ways to reward your dog for patience and self-control. This isn’t about being “dominant” or “alpha.” It’s about encouraging patient behavior. You don’t want a demanding, rude dog. You want a polite dog. So, if your dog is pawing at you for attention, ask him to lie down before you pet him. If your dog is eager to head out for a walk, ask him to sit or lie down at the door. Same goes before eating or playing with a toy or entering the dog park or whatever it might be. 3. Play “leave it/take it” type games. With these kinds of games, the dog is learning to control his impulse to grab the food. There are all sorts of videos about this and you can adjust the rules to fit you and your dog. The version I’m most familiar with is dog trainer Susan Garrett’s “It’s Yer Choice” game. I couldn’t find a great video, but the one below from a different trainer gives you a general idea. You start by holding small treats in your closed hand. Let your dog nose and mouth your closed hand and the second he stops nudging or licking your hand, you open your hand as a reward and pause. If he goes for the treats, you close your hand again. If he waits, you pick up one treat from your other hand and give it to him. No need to say “leave it.” Your dog is actually learning on his own that if he is patient, he gets the treat. It’s his choice to get the treat or not. No verbal command necessary. Very quickly, the dog will learn to back away from your hand in order to get the food faster. Even Remy learned this almost immediately, and the habit stuck with him. It’s really fun to watch them learn this so quickly. Next, you can set the food on the ground, which the trainer does in the video above. If he goes for the food before you say “take it” you would just cover it with your hand (assuming he’s not food aggressive). We like to train with the dehydrated raw treats from Campfire Treats. 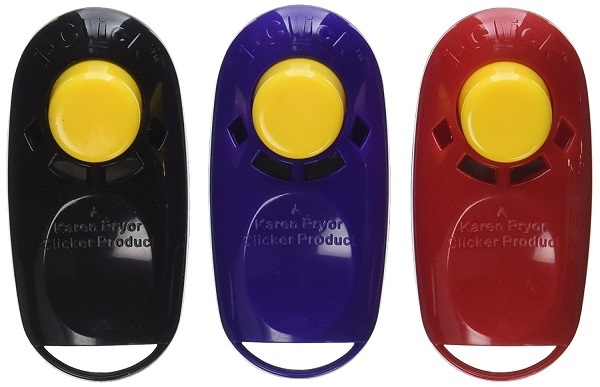 A clicker is a very helpful tool because you can “mark” the behavior you’re looking for the instant it occurs. The sound and timing of a clicker is more consistent than a person’s voice. The reason a clicker can help with impulse control is because the dog is making decisions on his own. He chooses what behaviors to do in order to get the “click” and the treat. Order a clicker here. Rude, “impulsive” behavior from my dog such as jumping on me or trying to grab the treats gets him nothing. Sitting, lying down (or whatever we’re working on) gets him the click and a treat. It’s a different way of training compared to the more traditional way of me telling my dog what to do. His little mind goes to work as he tries to figure out what I want to get the “click.” See my post: Common clicker training mistakes. 5. Knowing when to tell your dog NO. You have to decide when it’s best to ignore rude behaviors from your particular dog and when you need to step in and growl a firm “no” or even give a correction with the leash. This may sound harsh to some people, and we all train differently, but with my dogs there are certain behaviors that I won’t tolerate. Growling or lunging at my cats is one example. Both my dogs have tried this a few times, usually over food or guarding a dog bed. I get right in their bubble and give a firm “NO, absolutely not!” Then I give the cold shoulder for a few minutes in disgust. What ideas do the rest of you have for how to increase your dog’s impulse control? 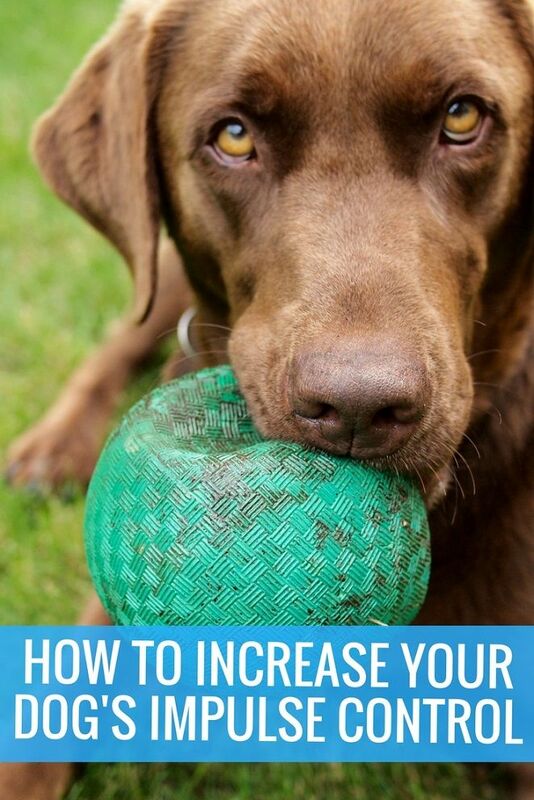 As you can see, there are a variety of ways you can work to increase your dog’s impulse control ranging from basic obedience to conditioning the behaviors you want using positive reinforcement. Let me know what ideas you have in the comments. I couldn’t agree more that impulse control is fundamental for stopping unwanted behavior. I have never tried a clicker, so I don’t know about that, but the other four ideas are spot on. Wow, harder than I thought. I have been working with my rescue dog on waiting a full minute before eating. 38 seconds in and she gets antsy. Granted we only started this week, I think it may be a long haul. My 3 yr old Boxer went through ‘puppy kindergarten’, passing. And she’s wonderful in the house…. but once she’s outside she has no impulse control. She’s not aggressive, never growls or snaps, but she jerks and bites the leash, and tries to pull it away from me if something distracts her or she gets bored on a walk. I will try revisiting the basis outside, rather than just inside as we normally do them. Thanks for reinforcing these. This is such a thorough article, Lindsay. It reminds me of all the small things I sometimes forget. Thanks! Btw, Remy is so cute! Oh good to hear, thank you! Such simple advice but it sounds so sensible and easy to carry out, thank you so much for your common sense!!! Looks like a fun way to learn self-control. My 18-month-old shepherd mix and 3-year-old Aussie know wait and will stay, but this would be a great reinforcement! Thanks for sharing. You totally forgot what I call “table time” at my house. Smaller dogs can use a grooming table. With bigger dogs like my Rott, I used an exercise step I get at the Goodwill. I can put 2-3 small pups on a big table and practice my sit, down, stand training. I also put them on the noose and work in the room washing dishes or vacuuming. They end up just watching me calmly. Grooming is such a good time to practice patience and holding still. Mine all like their turn on the table for this one on one attention. I find it helps a lot if I start table time with my puppies. Those that don’t get table time as babies are impulsive and never reach the level of concentration as the tabled pups do. My dog can heel, sit ,stay & down very well without the presence of only “NEW” dogs. Tried to train with a regular dog turn out she became neutral with the daily practise of the regular dog. Hope to find some suggestion for this issue.